Very cool. I like how the ivory flute looks like it was carved to resemble diseased wood or a length of duodenum. I'm fascinated by depictions of Hastur in general, and this one is pretty great without being "showy," which I think too many illustrations attempt. Really really nice work. 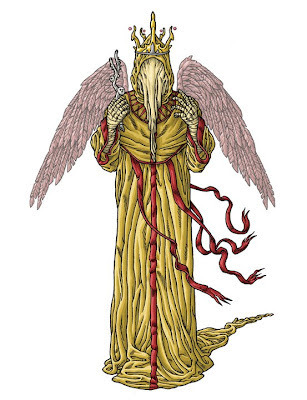 The comment may be late but the image is giving me ideas for a Hastur tattoo I have been considering. Oh hey, isn't that dialogue from Hebrews 10:31?